Look to the sky! Is it a bird? Is it a plane? No! 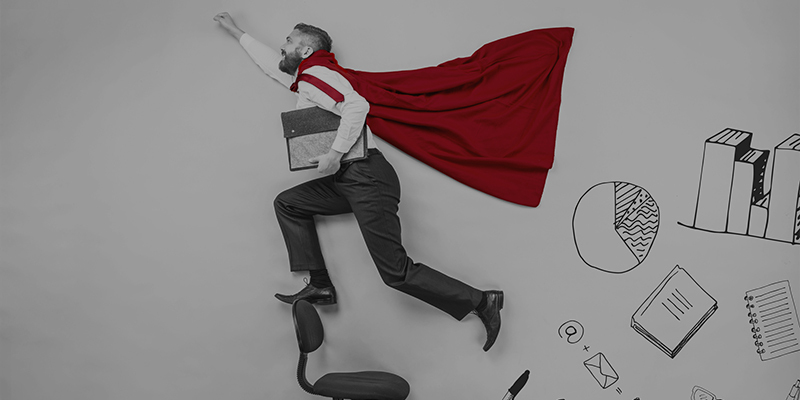 It’s your digitally super-powered worker!” Ok, admittedly, it doesn’t roll off the tongue like “Superman”, but it is true that digitalisation is supercharging today’s workplace. Through cloud-based environments, workers are now armed with unified communications across digital channels. This is enabling a telepathic ability to communicate thoughts and ideas no matter the time, location or device. Connecting in this easy, telepathic way provides a near-superhuman boost to operational efficiencies, giving projects the best possible chance of success because the right people can work together seamlessly. This enhanced level of connectivity is also helping break down the communication siloes that often plague larger organisations. With the ability to easily engage and collaborate across businesses, and access the right information, applications and services on their digital devices, every employee is a connected one. Bat an eye and you’ve probably already missed it. Enabled by the cloud, the digital worker has instant access to resources, information and colleagues, on demand and available 24/7, across all devices. This hyper-speed connectivity is improving business efficiencies by providing real-time availability and alignment within teams. This not only allows for projects to be completed faster, but also empowers employees with the ultimate freedom and choice of deciding when they get things done. The latest future-ready network technologies are now able to adapt to the unique needs of businesses and their employees. Designed to meet specific application performance and user experience requirements, these are the next generation of network solutions – more capable now than ever before to meet every real-time demand. Digital tools are enabling access to valuable new data and insights which, if used correctly, can help understand how to improve current customers’ experience and predict future demands. This is having a huge boost on efforts to optimise the customer journey. Internet of Things (IoT), machine learning and analytics tools are transforming how organisations collect, analyse and use customer data. As a result, businesses can spot trends and opportunities earlier, transforming them into actionable insights for how to best understand future customer behaviour and needs. This then enables enterprises to enhance operations and consumer engagement, creating a more personalised and seamless customer experience. These valuable insights are providing more clarity and intuition when looking to the future. Employees are now better able to embrace change and capitalise on new opportunities. This is ensuring that digitally enabled businesses remain both relevant and competitive in a fast-changing world. Virtually jumping from one place or meeting to the next – across offices and time zones – the digital worker is now omni-present, empowered by anywhere access with global connectivity, making physical location a soon-to-be irrelevant factor. Enabling a newfound sense of agility and mobility, and access to the right information, global connectivity is empowering an immediate response to issues and openings as soon as they arise. This not only boosts operational efficiencies, but is also enabling businesses with the ability to grasp opportunities and rise above competitors. No longer bound by the limits of the physical office, employees are now empowered with an increased sense of freedom to better balance their work and personal lives, while still guaranteeing a high level of productivity. With the proven positive impact of flexible working on health and wellbeing, employee satisfaction and retention is only increasing – making digitised businesses the most attractive prospect for future talent. Mobile working via the cloud presents new challenges to network security. Yet digitalisation has also enabled the availability of cyber security solutions that are being implemented to protect devices and data. This is empowering staff to safely navigate the potential threats online, freely accessing sensitive materials any and everywhere. For some, digitalisation has also provided a reassurance of physical safety. Digital wearables and Industrial IoT devices are helping to ensure worker safety by automatically monitoring equipment and environments. Not only is this contributing to a safer workplace, but real-time analytics are also being used to identify any issues that may have previously resulted in system downtime. Empowered by digital workplace technologies, businesses are now far better equipped to respond to the rapid and unpredictable changes of the transforming world. Within a single digital ecosystem, newfound levels of simplicity and productivity are beginning to be realised, helping to fuel future development and innovation. For more on transforming your workplace, download our practical guide - The digital workplace: A blueprint for innovation.